This month is sorta a miss for me. I was truly happy with one product and I like two of the product just okay. 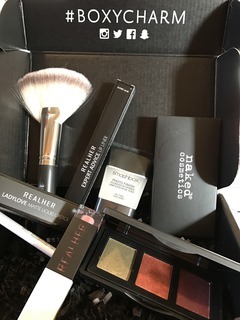 One product was super disappointing as it is not a full size product which is one of the huge perks of Boxycharm. I hope this will not be a continuing trend. So this is a deluxe size and it is big but it isn't their actual full sized product. Add to that the fact that this product has been around for like forever. It doesn't thrill me at all. I've tried it many times and I don't like the way it feels (very slippery) and it does nothing to improve staying power of my foundation. I think the E.L.F. Hydrating Primer which is only $6 is a thousand times better. I wish Boxycharm had gotten one of the newer formulas like mattifying or hydrating. That would have been so much better. This is my favorite product of the box. I love getting new brushes and I actually really enjoy Crown Brushes. It is great for highlighter or bronzer. It is very big so it is different than the fan brush we got a few months back. Nikki from NikkiTutorials on YouTube uses a brush like this in her get ready with me videos so I've been wanting to try one. This is one that I'm on the fence about. I love getting eyeshadows and I don't have anything like this in my collection. So for that alone I'm thrilled. The colors are a bit tricky to wear at my age so it will take some playing around to get the right look for me. I'm still happy with this one though and the pigment is fabulous! I'm so over liquid lipsticks!! The color is nice and the name is cute - I Deserve the Best. However it takes a long time to dry down and you have to keep it thin or it won't. Then when it does it is very dry and doesn't feel nice on the lip. I prefer actual lipstick because they are easy and comfortable to wear. Another thing that annoyed me about this product was RealHer Lipsticks are in this months Fab Fit Fun box. I didn't get one of those because I didn't want a duplicate product. They should have coordinated that better so they weren't coming at the same time. Why is this so expensive when the lipstick is just a few dollars more? I got the color - I am Precious. Cute name and nice color. It is nice but I'm not sure how to sharpen it. I think it is wooden? I prefer the kind you twist up and don't have to fuss with. It is creamy which is nice but just standard. I rarely wear lipliner but at least it wasn't another highlighter - right? This box is all FULL sized products and the retail on this box is $102.48!!! This was one of the lower monthly totals and I think the products chosen reflect that. Overall this wasn't my favorite but I'm looking forward to seeing if I'm wowed next month. Subscriptions cost $21 a month. Want to get your own subscription? Sign up below!